The Clos Jebsal is located on a steep slope, due South, in Turckheim. In this area, the fault lines are very close to each other, and the Keuper (Trias period) of the Jebsal is tucked in between the Granite of the Brand, the Muschelkalk of the Boland and the Oligocene of the Heimbourg. It is fascinating to see that in less than 500m it is possible to cross half a billion years of geological time! The limestone from the Keuper contains lots of marl and clay, and in this case is also rich in Gypsum. 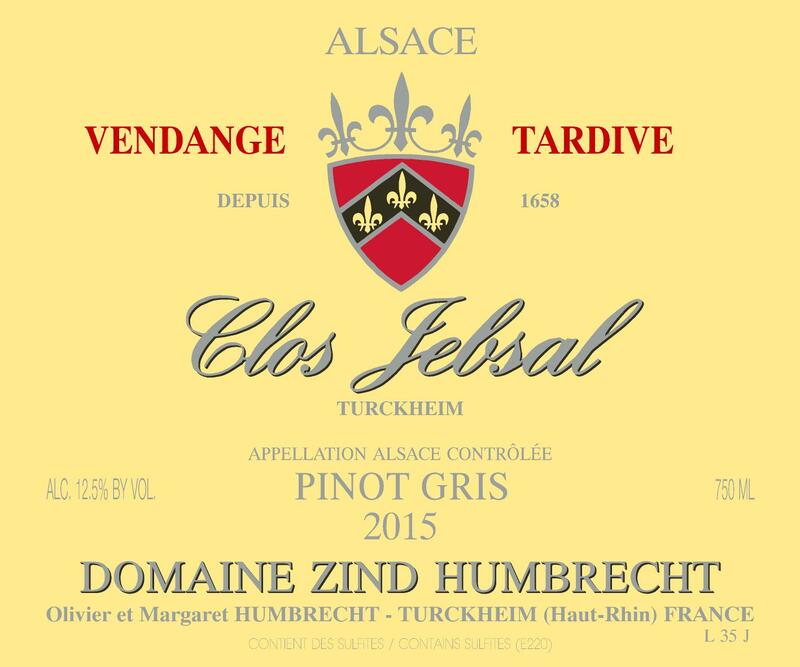 This is the only ‘lieu-dit’ of Turckheim directly named after the geology as Jebsal means ‘the place of gypsum’. Such soils stay cooler, keep more water and resist heat and drought very well. Grapes ripen very fast in this precocious micro climate and Jebsal always reaches a VT or SGN level. In 2015, the botrytis was slow to develop and in order to preserve a nice acidity we chose not to make a selection and only produced a Vendange Tardive. Fermentation was fast and the wine reached a classic balance. 8/2017: intense gold colour. As noble rot was in small proportion, the nose remains very fruity and elegant for such a wine. There are lots of white fruit, peach, apricots aromatics and only a little honey on the nose. The palate doesn’t come as a surprise, the nose has already announced a seductive and gently sweet mouth. Nice length, but no unnecessary weight. This wine will go far and should keep its seductive and harmonious balance.